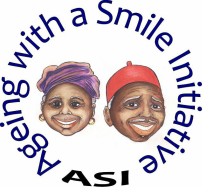 Ageing with a Smile Initiative (ASI) is a community based-organisation which was launched in The Gambia in January 2010 by the late Dr Abubacarr Gaye, former Minister of Health and Social Welfare. The organisation aims to promote and protect the health and welfare of older persons in the country. In traditional Gambian society, older persons have always been adequately cared for by family members, neighbours and the wider community. Changes in our life styles explained by a number of factors including growing economic problems are forcing individuals and families to be more concerned about their own development rather than caring for and supporting others. This situation is putting the lives of many disadvantaged elderly people in misery as they are neglected, living without adequate care and in some cases suffer in silence. The membership of ASI comprises of people from diverse backgrounds including medical doctors public health professionals, nurses, social workers, gender and human rights activists, etc. who work on a voluntary basis to deliver programmes that promote and protect the rights of older people and improve their welfare.